"A friend gave me this recipe for mincemeat many years ago. 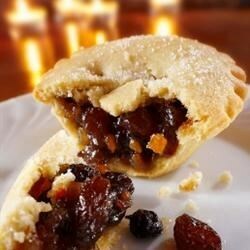 It is so good that even those who do not care for mincemeat pie likes it. If preferred, use molasses instead of sorghum. Also, apricot juice can be substituted for the pineapple juice. This makes enough filling for 2 (9 inch) pies." 1Combine the cooked beef, apples, raisins, sweet pickle vinegar, pineapple, orange, salt, cloves, cinnamon, nutmeg, sugar, sorghum and 1 cup beef broth. Store in the refrigerator or freeze until ready to use.